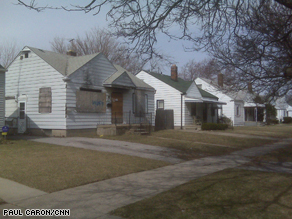 Program Note: For more on how Detroit is coping with the economy, tune in to AC360° tonight at 10 p.m. ET. 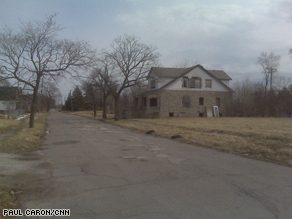 A neighborhood ghost town in Detroit. A home near 8 Mile Road, in the neighborhood where Caron's grandmother lived. It had been at least 10 years since I’d seen parts of my hometown Detroit's neighborhood streets. I grew up on the east side, and spent more time in the area during the early days of my career at the CNN Detroit Bureau. Could it be possibly be any worse than the blight I remember from back then? Yes. In some neighborhoods, empty lots outnumber the burnt out shells of what were once fine, middle-class homes. The area was built for the working class of the 1940s and 1950s, and survived the racial tensions and riots of 1967 but – like many things here – it could not survive the Motor City meltdown and its ripple effect. The drive into the city should have been fair warning. At midday, I-75, which winds through the heart of downtown Detroit, was as empty as a snow holiday in my current hometown of Atlanta. I expected the proverbial tumbleweed to roll across the highway. I remember that strip, a major highway leading to the Bridge to Canada, packed with trucks of all sizes. Not on this day, though. A row of industrial building for sale on Groesbeck Highway. One street off Van Dyke on Detroit's east side had 10 abandoned homes; four charred from fires. Yet there were still a few hold-outs, homes with people still living in them, coping everyday with a neighborhood in decay. I ran into a woman delivering mail for the post office, amazed people still lived in this area. "Sure they do, but yea, these other buildings, it's just sad. I feel safe, but it is a little surreal, with that,' she said, looking at one torched house, blackened from a fire, with mainly the frame still standing. A neglected plot had become just another eyesore for the city. The meltdown of these neighborhoods didn't all happen during this economic cycle. This has been going on for almost 40 years. In the ‘70s, Mayor Roman Gribbs invested in the downtown area. The Renaissance Center, now headquarters for General Motors, was built. In the ‘80s and ‘90s, Mayor Coleman Young didn’t invest much in many of the neighborhoods. The most recently elected Mayor, Kwame Kilpatrick, had his own share of problems, which eventually lead to his resignation and a city plagued by rampant decay. There doesn’t seem to be a light at the end of the tunnel for most people. I have immediate family and friends who work in the auto industry, and this recession is new territory for everyone. Some have watched property values plunge by 50 percent. A good friend, who owned an East side bar and grill, had been warning me now for over a year, "This is beyond a recession, this is a Depression.” He had to cut staff and figure out ways to stay in business given the reliance on consistent patronage of people in the auto industry. He showed me rows of industrial buildings up for sale on Groesbeck Highway, the major industrial highway in the east suburbs. "We're still at least a year from getting out of this," he guessed. The spring weather this week here was a psychological shot in the arm. The bleakest winter in memory is finally about to pass. But the abandoned homes and businesses aren't going anywhere ... hopefully neither are those good folks who still live in the city. Caroline, Los Angeles, the stadium is being torn down because a new stadium was built for the Tigers. That's right, the horrible Tigers got a new stadium while the Detroit Red Wings who have one multiple championships are still in a very old and too small Joe Louis Arena. I live & work on the northern border of Detroit and try to go into the city as often as possible. There are some great treasures in the city. I love the city of Detroit and it's a shame that we are in a depression. It's also a shame that while yes, things are bad here, none of the press ever shows the great things that happen in the city. Just the for sale signs & burnt out buildings. This city could be AMAZING if we could just get the help we need to pull ourselves up. Our politicians have not done much of what we expected to help. Here's hoping Detroit will pull through stronger & better than ever. owners of Japanese & Korean cars from outside MI with him. that people don't buy American cars to see if are talking with a straight face. Economic decay effects all of us--let's hope that the economic dentist arrives-–and soon. Public school's closing at a rapid rate under NCLB ? When there is educational stimulus money ? Privatization scheme or what ? Corporatism moving in ? Trillions of dollars being poured into what ? New Orleans and Detroit are both examples on how little we value our cities. They are also examples of what is wrong in this country. Being from Europe, people always point out how much history you can find in any city overseas. People there try to preserve their cities history and actually live in them whereas we just pack up and leave. Where is the American Spirit and the ability to reinvent ourselves? Detroit should not have to pay the price for greed and poor industrial planning. I hope that the city becomes the "green center" of this new age in economics! I'm currently a Detroit resident living in one of the many "nice pockets" of town. Between the crisis within our city government, public schools closing at a rapid rate, the decline of the Big Three and blight of neighborhoods...it seems as if there is a conspiracy to drive the last residents out of town. 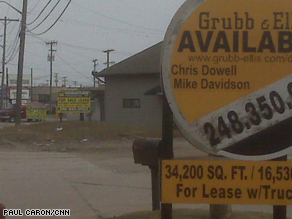 I grew up in a Detroit suburb and still remember the city as a vibrant place full of businesses. One of my best memories was taking the bus with my mom to shop at Hudson's, Siegals and others for school clothes. It's sad to see the city now, all the abandoned, vacant, burned out homes and businesses. I hope something can be done to bring it back! one is Greed......the other is Complacency. It is sad in my hometown as well...quite a few stores are empty. It seems like only yesterday that a strip shopping center was full of businesses...now they are empty and the shops at the mall are getting empty as well. My husband and I are retired with a pension...what would happen to us if that failed? Scary times...when the businesses fail, the houses become empty and the neighborhoods go away. I grew up in Southfield near 8 Mile and Inkster, went to law school in Detroit and worked my way through college and law school working for Chrysler (Hamtramck & Warren Truck). I Spent many afternoons and evenings at Tiger Stadium, shopped at Hudson's downtown, worked downtown, lived on W. Canfield near Wayne State and ate Greek food, burgers and drank beer all over the city. My mom grew up in Detroit and Ferndale and most of my family worked in the auto industry. Detroit not only was "The Motor City" it was the engine that powered the growth of its lovely suburbs and provided homes, education and employment for millions of people over generations. Although I now live out west, I am saddened to see the decline of Detroit. It was a truly great city and I am hopeful it will be again. A little less than 200 million dollars is not going to solve the mortgage crisis at all. Even if they did give up those bonuses (which I think they should; its blood money) its going to take far more money to get people their homes back. I think its a sad state when people don't even know what they can and cant afford anymore. We were duped into buying so much more than we needed and banks profitted off our greed. Its a twisted cycle and even though this crisis is bad I really think that it will fix alot of things that are wrong with our system in the end. The classy thing for the AIG folks to do would be to make a public display of them returning these bloated bonuses. Will it happen? One can only hope. 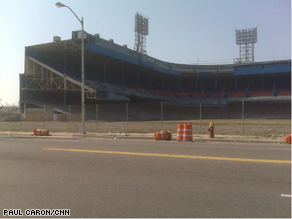 Why is the stadium half torn down? what's been happening in detroit is really sad. i know people may find this offensive, but i know enough about both areas to say that this city remindes me of the bronx or any other borough in new york. i hope that people can find the courage to stick it out there, because the people there are some of the best, nicest, real, hard working, focused people anywhere. I grew up in Detroit, but have lived in Chicago for 25 years. I'd like to know why the rest of the country is so hostile toward Detroit and indifferent to its plight. I actually hear people defend the Wall Street bonuses with "maybe they were depending on that money as part of their income," while at the same time saying the auto workers make too much money. Where is the compassion for these people and these companies that helped make America great? I hope the media and the government will try to do a little more cheerleading and less undermining of our great manufacturing businesses. How about pointing out that there is no longer a quality gap between American and foreign brands or highlighting something like GM's generosity in the wake of Hurricane Katrina. There are lots of Detroit feel-good stories; it would be nice to hear them once in a while. I thought these were supposed to be comments on the Detroit story. Well, my comment is Toledo, Ohio is almost as bad – at least well on its way to this. People are leaving in droves as soon as they graduate. There aren't too many jobs here unless you are a lawyer or doctor. Contrary to popular thought (particularly thoughts expressed by grandstanding congressmen) this mess is not entirely of the auto companies' making. The AIG-aided credit crunch was the immediate cause of the loan request. I found Congress's knowledge of the auto business to be at the level of cocktail party chit-chat. GM outsells Toyota in the U.S. Americans buy big cars/trucks. All of the auto companies (Japanese included) make money on trucks and lose money on small fuel-efficient cars. The Prius isn't selling, and an article in today's Chicago Tribune suggests, no hybrid car is profitable. So the government is saying show us your plan to be profitable, but do it with cars you can't sell. They also decry the union contracts and the companies' legacy costs (pensions and health care for retirees), while at the same time, expect the taxpayer to pay for congressmen to have lifelong pensions and health care. The hearings were one long advertisement for Toyota at the expense of our own companies. Is that going to help them get back on their feet? Will that help Detroit recover? I agree a lot with this being called a Depression since it seems so many people are losing their work; their homes; everything. I agree also that we haven't seen the end of all of this. So many people (months back) made it a point to talk about how it would be ending soon and all this devastation we're facing would turn around soon, or at least they hoped, but honestly I don't see it turning around for quite some time. Every day I wake up to my radio and I hear more and more are being given the pink slip at work. So I wonder, how far down will it go before we see a change? How much bleaker will things get? I don't even think we've yet reached the so-called "11th hour" yet. I would have hope it changes soon though, but still I have to wonder. Are there enough artists to gentrify all these abandoned neighborhoods? What about social support organizations? Charter schools? Day care centers? Seems like decent buildings and homes should be repurposed where possible. Are these budgeted in TALF? Obama's budget? Yeah it is very funny how The Government is reaming the CEO of AIG yet it was NOT him who allowed this to happen! HELLO Congress, do you really think we Americans are so stupid? We all know this was YOUR doing! NOT AIG I refuse to blame AIG for any of this, I blame that poor excuse of a Government we have running our country into the ground! I think it is all quite obvious that You guys in congress making AIG look bad is just to get the eyes off you but the truth is TOO LITTLE TOO LATE!! We know it was Government greedy officials who let this happen! Now I would like to see All the Idiots in Congress and The House FIRED!!! i woul like to see new faces in the White House,ones who are NOT rich and Greedy! and NO MORE LIARS!!! I grew up in Highland Park HP. The decline in the HP and Detroit was not due to the auto industry. The decline started in the 1967 riots. Within 3 years they became a combat zone. I could not believe that one racial group could devastate a city that fast. When you see boarded up homes in the exclusive areas like the Edison District, Indian Village and Palmer Woods, you know it is bad. I believe Detroit has about 90% black. I believe most of the blame would be them for the demise of the city. In order to try and revive the city, law and order would have to be restored. It is sad to hear about once nice homes being burned to the ground at a rapid rater Highland Park was a middle class city prior to the riots. It is now the worst city in the country. Nick Cullen: Dodd did NOT "add" anything at anyone's advise. Get it right. Dodd inserted language in his amendment to PREVENT bonuses in these circumstances. Treasurty Staffers advised him it might not be legal due to contract law involvement, etc..He pulled that language rather than risk tainting his whole amendment. AIG was NOT discussed..there were hundreds of other banks etc that potentially would be affected. And yet, I envy the steady traffic flow for commuters on I-75, a sight which I can only dream of seeing in the NY-metro area. I know what you mean about vacant abandoned houses where good neighborhoods used to be. Back in my hometown we had a section like that – houses from the 1800s and early 1900s (up to the Depression) which were abandoned, falling down, and in some cases condemned. A few people went together to restore a couple of houses and one of the churches and the neighborhood got listed on the historic register – more people came in and renovated these old houses, mostly with original materials and staying true to the original design and layout. The neighborhood is glorious now – its surrounded by not so nice neighborhoods but you forget about that as you walk around to see the houses – some with stained glass in their windows and all with that fresh cared for look of a much loved house . I hope your old neighborhoods have something similar happen to them. I recently saw the Detroit area for the first time in around 10 years while landing at Metro. It was a shock to see weekday rush hour traffic flowing fine with huge gaps. There's wonderful infrastructure, a highly-skilled and motivated workforce, and natural beauty throughout the southern half of the lower peninsula, but circumstances are shameful. It is depressing to see a great American city like Detroit so decimated. It has been 12 years since I was last there. It was in the process of revitalizing itself downtown. I know a lot of cities have made drastic comebacks over the years. If the Auto Industry continues to decline, I am worried what the final result would reap upon Detroit. I hope Detroit rises and becomes a vital city once again. Dodd should be sent to jail, people like him are the proublem. I know, it is sad to see what used to be such a vibrant city in such a state of shambles:( My parents grew up in Detroit and are afraid to go back to where they used to live, that says alot! What is happening to Detroit is not about a city it is about people. Many good people have been there for years creating live, communities, families, and industry to support what the market wanted. Now it is in a tailspin and what does everyone do. They watch, like a bad car accident and send a prayer of thanks it is not them. What happened to stopping out, giving a hand, and providing support to get people strong and on the road again. This time period is not about watching Detroit go down the tubes and say sorry it is your own fault....this time period is where we show "our brothers and sisters" we are here for them. We need to reach in and give a hand and help them out. That is what neighbors and friends are for and that is what makes America unique. We help each other out and we rise together. Is anyone else out there in TV land thinking that we actually might need a revolution in America? I know you are. I know I'm not the only one out here who's starting to think about the "R" word. People here in Middle America are very, very angry–angrier than I've ever seen them in my life. If this system can't be reformed, then it's time for it to go. Let's just call a constitutional convention or something like that and just say to the aristocrats running things: "You're done. This is the end. We've taken all we're going to take." Now I believe Obama is sincere and that he's trying his best to make reforms, and my outrage is not directed against him. It's just that this system is so obviously corrupt and unrepresentative of us that serious changes have to be made. Last night you as well as others were jumping on the AIG bandwagon. These retentions bonuses are valid due to law.And Washington is pushing AIG because it gets the monkey off their backs for the Billions of Dollars they used as PORK. And now the honorable Senator Dodd admits it was his staff that added it at the request of Treasury. The same Mr Geither that chastised AIG. Sen Dodd now states it was done to protect the rest of the amendment. Isn't that typical of all of our politicians?And remember this is the same Sen Dodd that got a low rate loan from Countrywide. It seems he should resign because he is in deeper than anyone knows. Wolf Blitwer also is supporting Sen Dodd. Wolf-WAKE UP. My comment on the Aig bonuses is that they should take this money back from Aig and give it to the mortgage crisis. people are losing their homes at record numbers and they need the money more than these Aig executives. put the money where is is needed the most, the homeowners need the money more than the Aig executives. lets put things in prospective here.